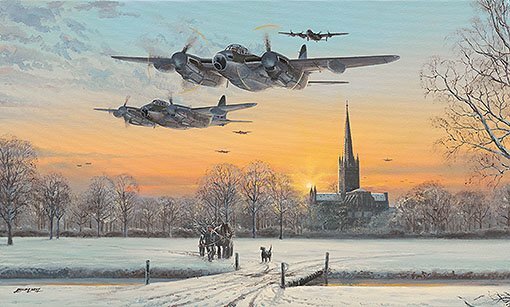 Passing low over Norwich Cathedral on this wintry evening, Pathfinder Mosquitoes begin to transit east from their bases on yet another dangerous night-time mission over enemy territory. They will take the lead on this bombing mission and their role is to identify and mark pre-planned targets with flares, enabling the main force of Lancaster and Halifax aircraft to drop their bombs as accurately as possible. The Pathfinders were elite squadrons in RAF Bomber Command. Like all aircrew, these brave men took the fight to the enemy night after night until victory was achieved. The Primary Edition is signed by a Mosquito Pathfinder pilot and the Artists Proofs have additionally been signed by five Lancaster pilots. For morer details please see below the prices.